The first article in a four-part series on olive oil production in Andalusia. To drive through Jaén in south-central Spain is to experience its vast scale of olive trees and olive oil culture. It’s no wonder they call the groves here the Sea of Olive Trees. In neat rows and over gentle mountains, they stretch as far as the eye can see. As we keep driving, the olive trees keep going and going. Jaén is home to the largest area of olive groves in the world. Three hundred million olive trees flourish over an area of about 2.5 million hectares, almost 1,000 square miles. Jaén produces about 40 percent of Spain’s olive oil and 20 percent of the world’s. 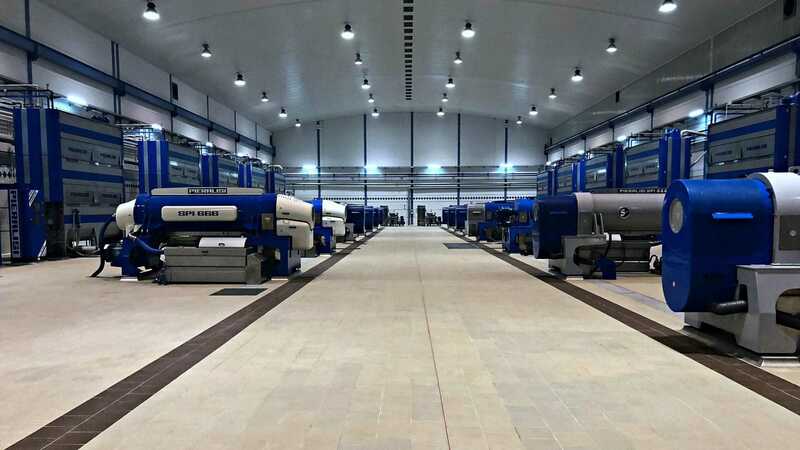 The massive amount of olives demands enormous and efficient facilities, almazaras (olive mills) where they are cleaned, milled and processed. Almazara Nuestra Señora del Pilar is the biggest of them all. The Almazara was founded in 1966 in a tiny town called Villacarillo in the district of La Loma y Las Villas with 16 members when José María Pastor Bueno opened a factory equipped with 10 presses, mixes and rollers. Since then, the facility has grown and innovated many times over. During the 2018/2019 harvest, 1,709 active members will bring their olives here to be transformed into oil. They include small family farms and major operations that together harvest 1.5 million olive trees. In a single year, they will produce 20,000 tons of olive oil — that’s twice the average annual production of the United States. Paco Corrido, Almazara del Pilar’s vice president of operations, showed me around the factory earlier this month. On November 14, the very first truckload of olives arrived for the season. The date was unusually late due to a rainy autumn, and so the huge factory was shiny, quiet, and still. In the days that followed, that was going to change dramatically. Every day for the next three months, the facility is expecting to receive about two million kilos (2,205 tons) of olives. On a busy morning, 1,500 trucks full of olives arrive for milling. They are organized into 80 lines of reception. 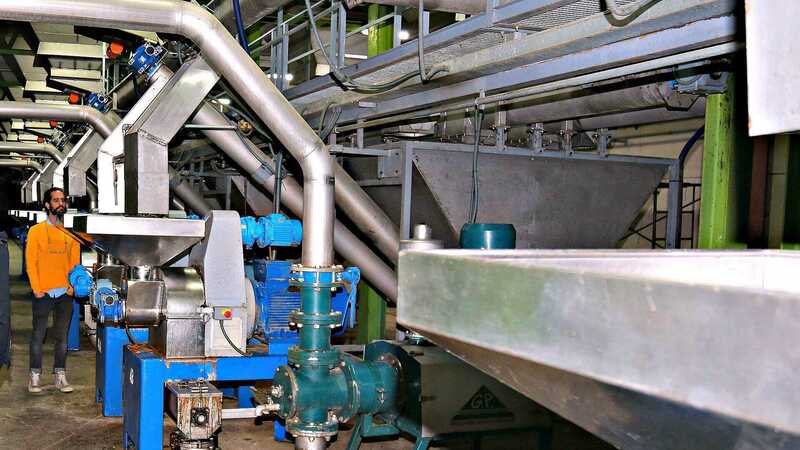 In an average year, the mill will process between 70 and 80 million kilos (between 77,000 and 88,000 tons) of olives. “Our best year was 2013/2014, when we processed 100 million kilos,” says Corrido. “It was historic. This year, we’re expecting 90 million kilos. That’s much more than average.” Moderate weather and copious rain made this year’s harvest productive, especially after several years of drought. About 85 million kilos of olive oil will be Picual, which accounts a significant majority of Jaén’s olive crop; the rest will consist of Arbequina. 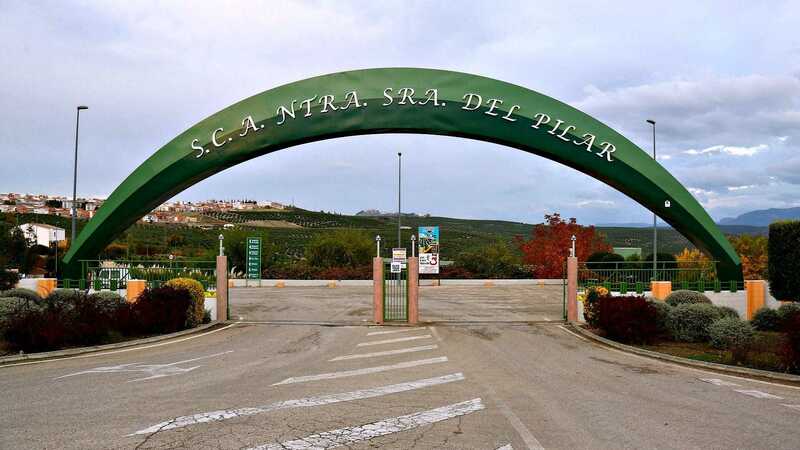 Almazara del Pilar’s new eco-friendly facility was built in 2010 and completed in 2011 (before that, their last major renovation was in 1984). 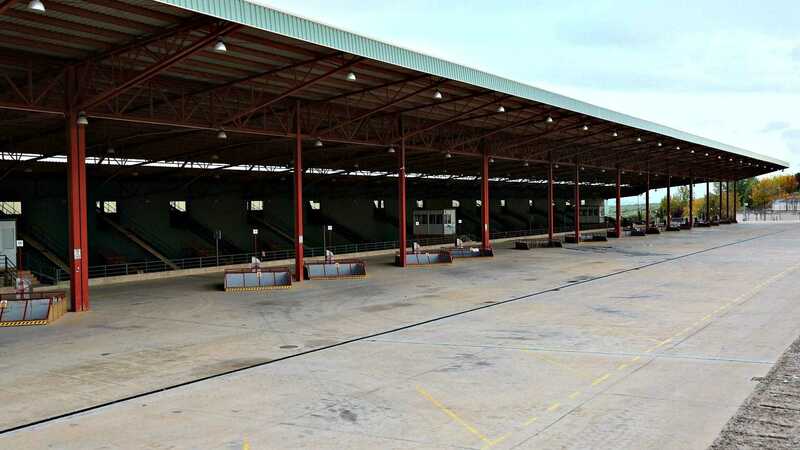 The factory spans 40 acres with a three-acre space devoted to extraction and four warehouses. Olive trees line the property. From the trucks, the olives are sorted into 18 lines. Two lines are reserved for olives that arrive already cleaned, the other 16 will continue to remove debris and dirt from the fresh fruits. A transparency system tracks which olives come from which farms during the entirety of the process. The final product includes QR codes that provide that information. 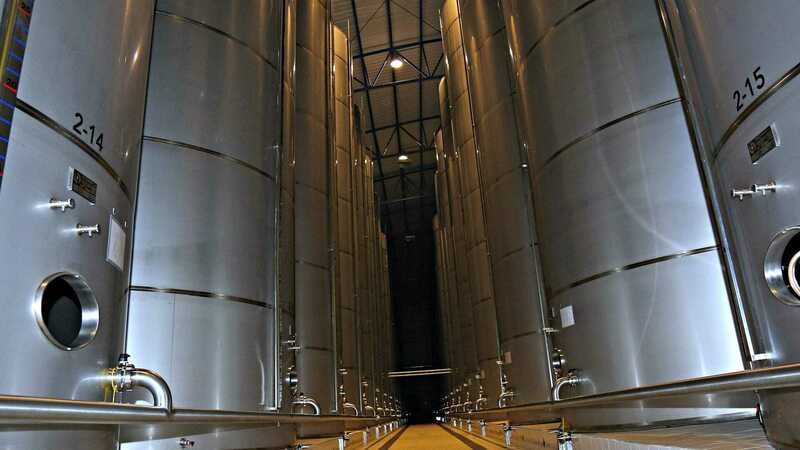 Twenty-four crushers turn the olives into a paste that passes first through one of 12 massive horizontal centrifuges, which separate the solid matter from the water and oil, and then a vertical centrifuge, which extracts the oil from the water. 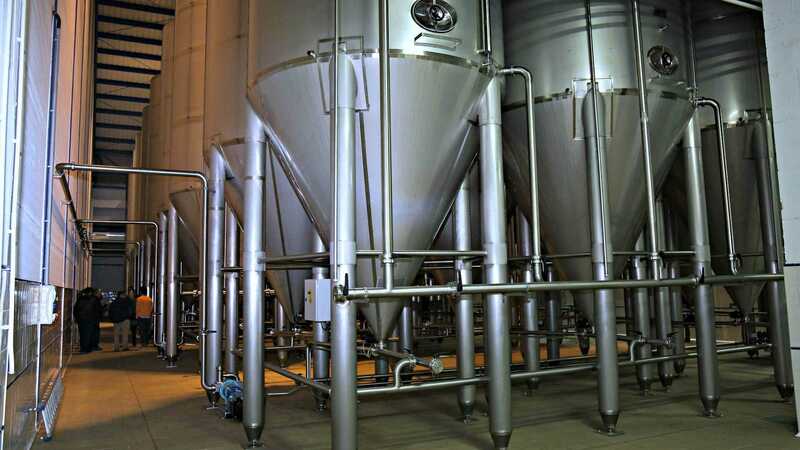 Like a cream separator in a dairy, the vertical centrifuge uses gravity to separate the heavier water from the lighter oil. They remove the last minuscule amounts of water from the oil. This state-of-the-art machinery creates zero waste. The solid matter is used for energy to power the factory, and the excess goes to feeding local pigs and cosmetic products. 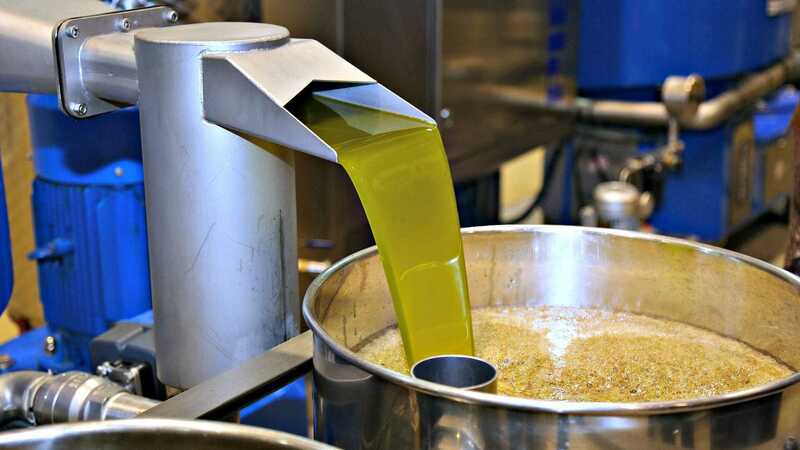 The process also uses significantly less water than is typically required in pressing olive oil. “Taking care of the environment, leaving it healthy for our children, that is crucial,” says Corrido. The oil is then decanted for 24 hours in 12 gigantic decanters. The oil in each decanter gets tasted and evaluated. There are 156 tanks, with a total capacity of 17 million kilos (1,739 tons) keep the oil. The whole lot then gets trucked to the nearby Jaencoop where it is filtered and bottled (co-ops like Almazara del Pilar that mill oil are called “first degree co-ops.” The operations that bottle, market, and sell olive oil are “second-degree co-ops”). About 90 percent of the oil is sold in bulk. The other 10% is packaged and marketed under the Cazorliva brand. Jaencoop receives its olive oils from 16 different mills — the largest being Almazara del Pilar. “We pay members according to quality,” Corrido explains. “Because the process takes time, they usually get paid in full about a year after bringing in their olives.” They get an initial amount upon delivering their crop to the co-op. Only eight full-time employees oversee this impressive operation year-round. During harvest, a team of 45 work at Almazara del Pilar, many of whom are local farmers. “It’s a team effort,” notes Corrido. “It takes tremendous work and investment to do this right.” Optimizing every phase of the production leads to a higher quality product. At Almazara del Pilar, they have it down to a science.